Rhubarb is one of those funny New England fruits- like gooseberries or husk cherries- that sound adorable and quaint to the uninitiated, rather like something our grandparents might’ve made into a buckle or a fool. Then there are the devoted fans who know: there are few things better than an ice-cold slice of rhubarb pie. We have two rhubarb plants in our gardens- they’ve been here way longer than any homeowner- and every year we look forward to the first rhubarb pie of the season the way others look for the first robin sighting or the first blooming lilacs. Rhubarb and I go way back. My mom used to make rhubarb pie when I was growing up, which is kinda weird, since we lived in the suburbs. I used to think she picked it from a plant in the backyard like we do now, but she recently told me that no, she bought it at the market- the plant we had was too sour, even for rhubarb. No matter. 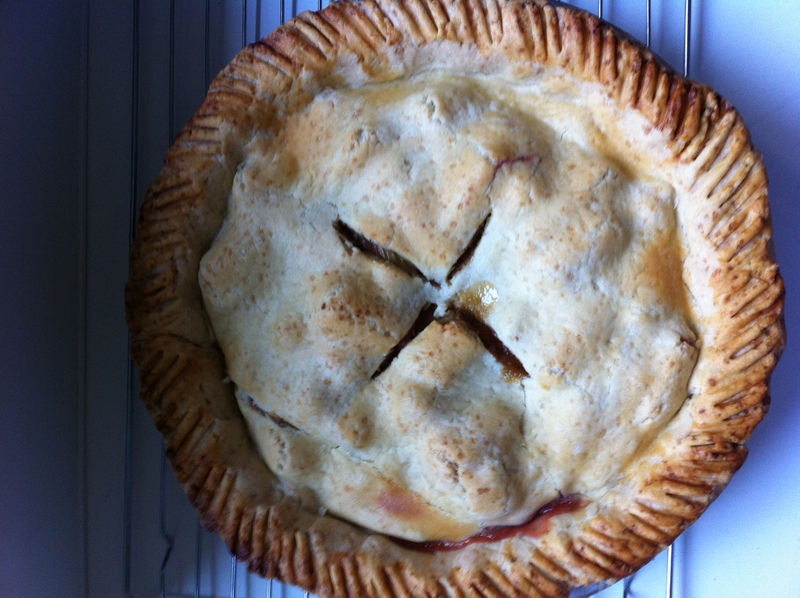 I still have my Mom’s recipe, complete with her perfect five-minute Cuisinart crust, and I make it every year with an almost religious devotion: for me, eating that first bite of rhubarb sweet-sour pie is reliving a moment of childhood happiness. So of course, as soon as the stalks were up from the ground this spring, I set my sights on dear old rhubarb pie for our May monthly dessert. It almost came to a food fight though: our eleven year old wanted Coconut Vanilla Pudding Cake and our six year old has her heart set on a batch of sugar cookies. Nurturing my inner tyrant, I decided that since neither of those choices was seasonally dependent, plus the fact that I had the distinct advantage of being the one who would actually make the dessert, rhubarb would prevail. Caesar lives. The funny thing about so many pies is how much better they can get after a day of sitting in the refrigerator, getting chilled and letting all those sweet and sour and buttery flavors rest and meld together. Rhubarb pie is a classic example of this: out of the oven it is really, really good. Our of the fridge the next day? Ridiculous. Amazing. Something was amiss. At first I couldn’t put my finger on it, and finally I realized it was this… this taste in my mouth… like the aftertaste you get from drinking a diet soda. Bleh! What was that? Then I knew: it was the sugar. Sugar and I, it seems, are now like old friends who haven’t seen each other in so long that when they get together it’s fun, but… a little awkward. Nobody is more surprised than me about this turn of events. I expected a lot of things in our Year of No Sugar project: to gradually lose cravings for sugar (which I have), perhaps to lose a few pounds (which I haven’t), to notice sugar’s effects much more dramatically (which I have). For some reason, though, I didn’t expect to lose my taste for sugar itself. Does this mean (shudder) no more enjoying treats… ever? Meanwhile, I’ve been exploring the online work of Australian author David Gillespie, author of Sweet Poison, who I am going to insist on mentioning repeatedly until you go out and buy his book, because he’s a freakin genius. (If you do buy his book, be sure it is by Gillespie; in America there is a book by the same name by Dr. Janet Hull which focuses on the evils of aspartame). It was in Gillespie’s book that I first heard about the possibility of using dextrose as a sweetener. Dextrose isn’t fructose; it is recognized by the body as glucose, which means your body knows what to do with it. Could this be? I wondered. Could we really have a dessert that didn’t have sugar in it or taste like bananas? And was actually good? I fairly salivated at the prospect. Spurred on by what is left of my sweet tooth, I tackled David’s online recipe for “Strawberry Ricotta Cheesecake.” I was fully prepared to be deeply disappointed. I reminded the kids this was “an experiment” and might not be as wonderfully delicious as the name might suggest. But it did look pretty great in the oven, rising and browning just a bit on the top… and the smell was a warm, faint strawberry-inflected sweetness, distinctly dessert-y. One bite, however, and my skepticism evaporated. In it’s place appeared surprise. Also, delight. I smiled big. I looked around and saw that the kids were smiling big too- in between big bites of white fluffy dessert- dessert that contained no fructose… effectively no added sugar. And it was GOOD! Really good! If this was a made-for-TV movie, this would be the exact moment that the soundtrack featuring the Hallelujah chorus would break in, playing jubilantly over jump-cuts of us stuffing our faces with the fluffy treat. I couldn’t stop exclaiming how good it really was! I mean, it wasn’t S-W-E-E-T !! !… but it was quietly sweet- which at this point seems to be what we really prefer anyway. We all polished off our plates. The kids immediately were getting ideas: could we make ice cream with dextrose? How about sugar cookies? Although I am old enough to be suspicious of anything that promises to be a panacea, I can’t help but wonder: would it work- and equally important, would it be heresy- to attempt a dextrose rhubarb pie? yes I use dextrose to sweeten rhubarb, you need a generous amount though! I thought I’d have to give up rhubarb… I have 2 varieties in my garden, one red stemmed that needs far more sweetening than the one with half green half pink stems. Great relief that I can still make my rhubarb cake, which is an almost custardy/eggy cake with chunks of rhubarb through it. What a relief! Don’t suppose you’d be willing to part with that Rhubarb Cake recipe…? Beat butter and sugar till pale and fluffy. Add eggs a little at a time beating well after each addition. If mixture starts to curdle add a tbsp of the flour. Add the vanilla. Then fold in the flour adding enough milk to give the batter a reluctant dropping consistency. Scrape into a buttered 20cm springform cake tin. Toss the rhubarb over the top of the cake mixture. Bake 40mins 190 degrees Celcius. 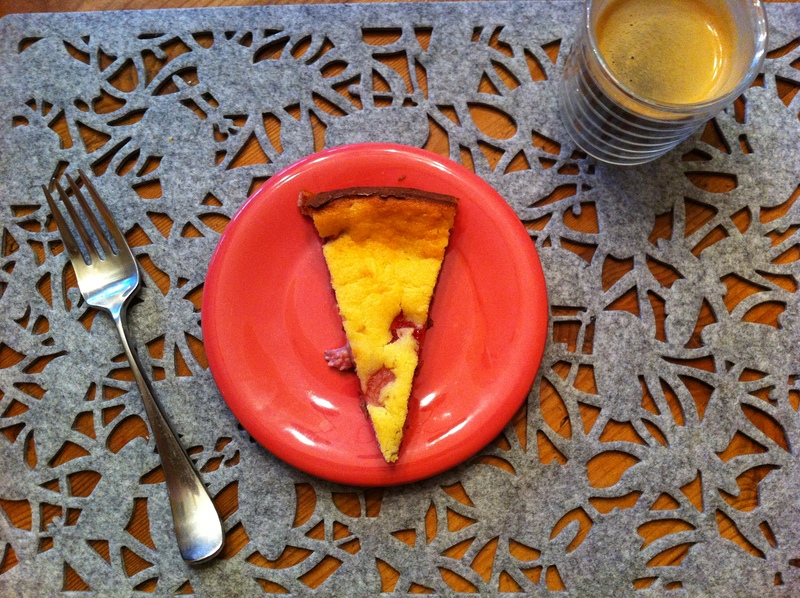 The rhubarb sinks into the cake as it cooks with some pieces sticking out the top and looking rather rustic. When a skewer inserted into the middle comes out clean it is cooked. Cool cake in the tin, then carefully remove from the ring and base. Dust with icing sugar if liked, before serving with whole Greek yogurt or freshly whipped cream. A brilliant eggy cake that straddles cakedom and custard! Can be used as a blueprint for other fruit topped cakes. I’ve made this many times, it’s a keeper! Hope you like it. I love all Diana Henry’s cookbooks. 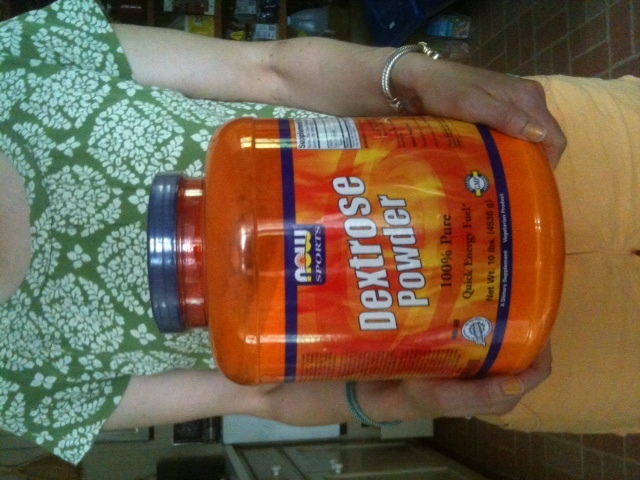 so why is Dextrose ok to use? Isn’t dextrose a form of glucose? Pricilla- What I’ve been told by folks who know more than me about how the body works is that your body runs on glucose, and yes, dextrose is glucose. What you need to worry about is fructose- that is the stuff your body doesn’t know what to do with and treats like a toxin. I got the idea to use dextrose in cooking from David Gillespie in his book Sweet Poison- an excellent read if you want to learn much more about how the body’s biochemistry functions, and exactly why it is that fructose is so bad for you. You are currently reading A Year Of No Sugar: Post 53 at Eve O. Schaub.